Growing appeals for more public infrastructure investment make two critical claims: that this would help stimulate the economy in the short run while making our country more productive over the long run. Unlike tax rebates and other short-term stimulus, a major infrastructure investment program can have powerful effects on community life beyond boosting spending at the local Wal-Mart. I thought about this recently when I visited my boyhood hometown of Wishek, North Dakota. Wishek is a small, farming town of 1,200 people nestled in the gently rolling hills of the central Dakotas, about 17 miles from the South Dakota border. Its population is made up largely of people who trace their origins to German immigrants from Russia. These people previously were recruited by Catherine the Great to farm the steppes near the Black Sea. Seeing a greater opportunity in North America, these Germans started to arrive in 1885 to homestead the Dakotas’ deep sod prairie – a glacial moraine of earth and rock. They were lured by the romantic thrill of developing a “Territorial Empire” that later became the states of North and South Dakota. This dream was widely realized by the 1920s but all but dried up and almost blew away during the drought-ridden thirties. That dream would have extinguished if not for the enlightened programs of the New Deal --- from soil conservation to loans for farmers to the Works Progress Administration (WPA). Growing up in Wishek during the 50s and 60s, you rarely heard about the New Deal. Life was good, pretty much everything you might imagine small town childhood to be in Middle America. The pace of life was easy; everyone knew everyone and almost everything about anyone. The fortunes of the community rose and fell with farm prices, sometimes fluctuating wildly from year to year. Kids roamed freely on foot and in cheaply fueled cars and there were ample opportunities to participate in almost every facet of community life. With a k-12 school population of about 500 to 600, any child or young person who wanted to could play some kind of role in sports, arts and music, or church related activities. Unknown to me --- and not widely discussed by the 1960s --- was how many of the community’s best and most used facilities were constructed by the WPA. During the drought years of the mid-‘30s, the city park was enlarged and developed with a children’s playground, clay-surfaced tennis courts and a light skating rink paid for by WPA. Later a $6,000 bond issue was floated to build a pool that was designed by WPA engineers and is still in use today. Then in 1942 a new auditorium --- a truly landmark building for the community --- was completed for use by the school district. The auditorium continues to be used today as a civic center for community and family events including Wishek’s premier regional event the annual Sauerkraut Days. "In North Dakota the W.P.A. alone, between July 1, 1935 and June 30, 1942, built 20,373 miles of highways and streets, 721 new bridges and railroads, 166 miles of sidewalks, 15,012 culverts, 503 new public buildings, 61 additions to public buildings, 680 outdoor recreation facilities, 809 water wells, 2 irrigation projects, 39 sewage treatment plants and 9 water treatment plants. It reconstructed 1,002 bridges and viaducts, 2,180 public buildings and 1,721 culverts." To be sure, today is not the “dirty” thirties of the Dust Bowl. It is also far different from the serene place of my boyhood in the 50s and 60s. Some of the old infrastructure needs maintenance while other infrastructure needs have changed significantly. A proposed wind farm just south of town, for example, has been delayed because of the lack of electric transmission capacity throughout the region. 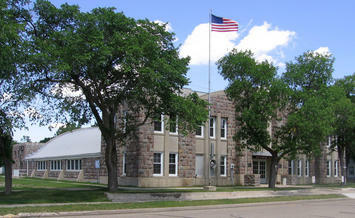 In addition, like many rural communities the major employment base is now in manufacturing and health services, pointing to the increasing and essential importance of broadband telecommunications, roads and air service that permit link places like Wishek with the national and international economy. Yet if we look about us, the legacy of New Deal endures to this day. It provides clear evidence of the impact that infrastructure investment can make on even the smallest of communities. Much of the current discussions about infrastructure investment too often focus on the giant projects and national implications. However, the case for a renewed investment agenda can be made most persuasively by pointing out what such investments have done for local communities --- city or small town --- in the past. And what they might have failed to become if there had never been a New Deal. Delore Zimmerman is CEO of Praxis Strategy Group and Publisher of www.newgeography.com. Submitted by davebarnes on Mon, 08/11/2008 - 12:19. One could argue that the WPA effort was a mistake as it merely delayed the death of Wishek and Mcintosh County. The population of the county has dropped by 19% in the last 8 years! That is huge. Soon, there will be no one left. Perhaps it would have been better to have encourage all the people to leave Wishek back in the 1930s and spent the WPA money in a larger city that is more viable. Enduring is certainly not the proper word to use for Wishek.